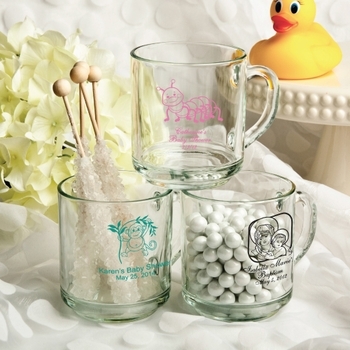 Perk up your baby shower guests with a glass mug that's sure to get lots of use! This personalized favor makes a wonderful keepsake that will keep the memories of your special day brewing for years to come. Each mug measures 3 1/2 inches tall by 4 inches in diameter with a 10 ounce capacity and a sturdy handle. Minimum order is 30 and shipping is included. Made in the USA and ready to be silk screened with your choice of a large variety of all themes, graphics, colors, and titles that match your event and your style. Gift boxes are also available for $.75 each. Just click the "Click Here to Design Your Personalized Mugs" button to the right of the item photo to open the custom designer. After you create your design, simply click the "Submit" button which will automatically fill your design choices into the boxes on the right. Please read the description under the photo before designing your mugs.